Although frameless is still king, there’s a new look making its way into designer bathrooms. 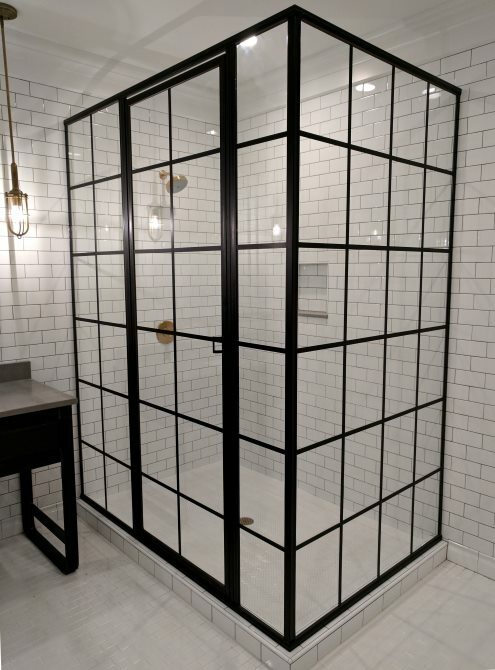 The gridded (or divided lite) shower is an increasingly popular style for homeowners who want to buck the minimalist trend of a nearly all glass shower, and instead embrace the metal by going so far as to let it define the contours of the space. With its factory window or industrial vibe, the GridLite look pairs beautifully with subway or other simple ceramic tiles to give an urban loft feel. Love it or hate it, you’ve got to admit it certainly has more presence than its frameless counterpart. This design trend is popping up in more than just bathrooms. 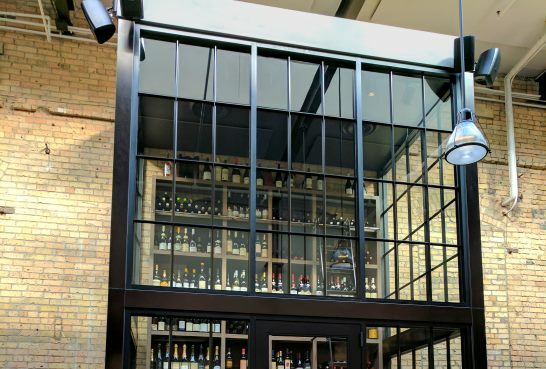 We spotted this divided lite wine storage at Minneapolis’s culinary hotspot, Spoon & Stable. As you can see, exposed brick provides a stunning backdrop for it as well. I’m sure some of you are thinking, these glass people already want me to squeegee my shower after use, there’s no freakin’ way I’m drying each one of those small panes individually. Well, that’s the nice thing about GridLite – it’s an exterior applique not a true divide lite, so the inside of the shower is still one continuous glass surface. The grids are only applied to the outside of the glass, so they’re not collecting soap and shampoo residue and all the rest on the shower’s interior. That means you get the industrial edge of a gridded shower, without the addition maintenance. Not bad.